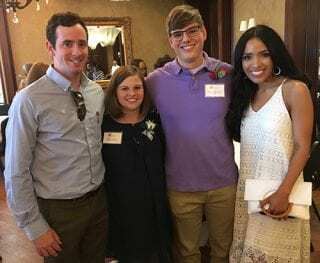 Jaclyn Johnson and Nick Hopkins, center, are pictured with their spouses, Jordan Johnson and Madison Hopkins. Two nurses who work as hourly clinical instructors for the Eleanor Mann School of Nursing at the University of Arkansas were named this summer to the 40 Nurse Leaders Under 40 list by the Arkansas Center for Nursing. Nick Hopkins and Jaclyn Johnson were honored at a recognition event, where they received pins and certificates. Both are U of A graduates of the nursing school. The mission of the Arkansas Center for Nursing, Inc. is to promote a culture of health for the citizens of Arkansas by advancing nursing education, practice, leadership and workforce development. The 40 Nurse Leaders Under 40 program is designed to recognize nurses who have shown exemplar dedication to the nursing profession. They are acknowledged as community outreach servants and show continued promise to grow in leadership and the advancement of the nursing profession. Hopkins earned a Bachelor of Science in Nursing from the University of Arkansas in 2014 and is pursuing a Master of Science in Nursing from the University of Arkansas for Medical Sciences to become a psychiatric-mental health nurse practitioner. He began teaching mental health for second-semester nursing student at the U of A in the spring of 2016. Hopkins also has worked at Advanced Orthopaedic Specialists for the past two years and previously worked in the emergency room and the progressive care unit at Physicians Specialty Hospital. He said nursing is a profession that many people go into, not because they want awards or to be recognized, but because they care about helping people. “So, to be recognized as one of the top 40 nurse leaders under 40 in Arkansas really meant a lot,” Hopkins said. “I’m still a relatively new nurse so most of the students that I had in clinicals were just a few years younger than me and some were even older than me. I worked hard to lead by example for all of my students and show them that no matter how many years you’ve been a nurse you can be a leader. Nursing students and graduates are aware of the nursing shortage, he said. Mentoring student nurses as they work toward earning their bachelor’s degree. Conducting research related to mental health while in his master’s program at UAMS. Volunteering as head nurse of the Ability ministry at Cross Church in Springdale. Johnson earned a Bachelor of Science in Nursing from the U of A in 2013 and a master’s degree in nursing education from Western Governors University in Salt Lake City, Utah, in 2017. She has been a clinical instructor at the U of A for two years and currently teaches first-semester nursing students. Mentoring fellow nurses while they pursue their career goals. Creating a school health program from scratch as the first school nurse of a local private school. Serving as a charge nurse on the pediatrics floor at Washington Regional Medical Center. Giving a presentation to Eleanor Mann School of Nursing staff regarding causes, prevention and treatment of nursing student stress.